Hundreds of thousands of people have been displaced by Cyclone Idai after it tore through southern Africa. At least 1,000 people are feared dead. Survivors who were clinging to tree branches and rooftops a week after the storm brought devastation to Mozambique, Malawi and Zimbabwe continued to be rescued. But aid has been slow to reach affected villages because of damage to infrastructure. Idai smashed into the port city of Beira with winds of up to 105mph last Thursday, then tracked inland to Zimbabwe and Malawi, flattening buildings along the way and putting the lives of millions at risk. The cyclone’s torrential rains also called the Buzi River and Pungue River, whose mouths are in the Beira area, to flood their banks, with the UN satellite agency saying floodwaters covered 835 square miles on 20 March. 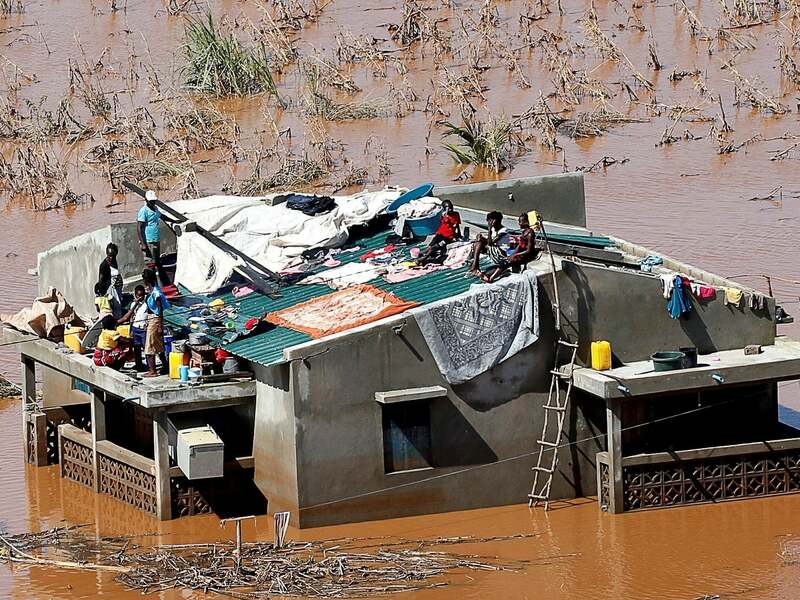 The cyclone brought floodwaters to the plains of central Mozambique, submerging homes, villages and entire towns. Helicopters have this week, been searching for people to rescue in the countryside near the worst-hit city of Beira, which has become the main headquarters for the rescue operation in Mozambique. At least 242 people were killed in Mozambique, land and environment minister Celso Correira said. He added that the number of dead was expected to rise as floodwaters recede. Mr Correira also said around 15,000 people, many of them seriously ill, still need to be rescued. ”Our biggest fight is against the clock,” he said, adding that 3,000 people had been rescued so far,” he said. In Zimbabwe, the death toll jumped to 139. The United Nations World Food Programme (WFP), which is coordinating food drops, said 200,000 Zimbabweans would need urgent food aid for three months. So far, 56 people have been confirmed dead in Malawi. Aid organisations have provided food, water and clothing to those displaced by the tragedy. The International Federation of Red Cross and Red Crescent Societies (IFRC) said it was sending two emergency units to Beira to provide drinking water for up to 15,000 people and sanitation facilities for 20,000 people, as well as shelter kits. The WFP has stepped up airdrops of high-energy biscuits and water purification tablets to isolated pockets of people stranded by the floodwaters. The UK government has pledged to match the first £2m donated by the public to the Disasters Emergency Committee and major broadcasters will air appeals in support of fundraising. Britain has already announced an aid package of £18m for the region and the Department for International Development has chartered planes to help the government of Mozambique transport power generators to areas without electricity and support the delivery of easy-to-prepare fortified foods. Four experts have also been sent from London to coordinate the disaster response on the ground. Mozambique’s president Filipe Nyusi, who declared three days of national mourning starting on Wednesday, has said the eventual death toll from the cyclone and floods could rise to more than 1,000.